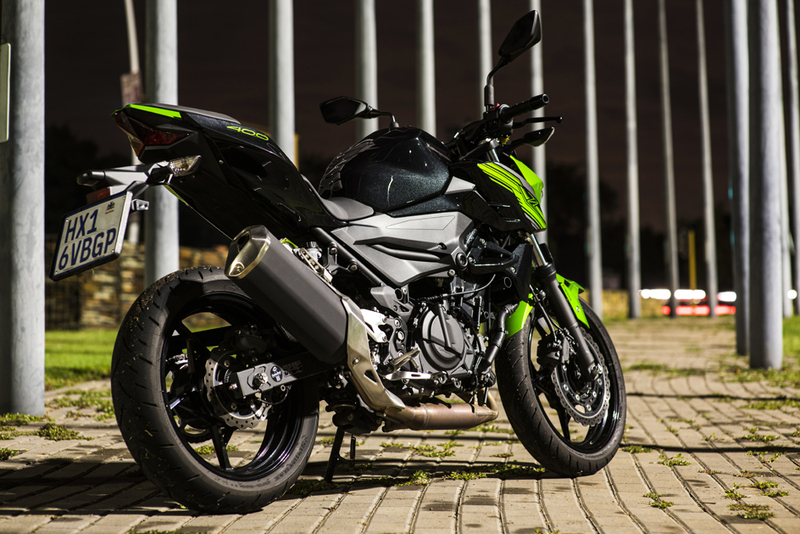 The post Kawasaki Z400: The Green Hornet appeared first on . On the dark side of Japan, there’s a group that rule the streets and they go by the name of “The Z Gang”. This notorious group of street fighters live and breathe the Sugomi lifestyle, which translates to something wild, something fierce and ready to pounce on its prey. With rumours floating around about a new Z on the block, I decided to track down this new so called Z to find out if it has what it takes to wear the Z badge. Midnight was the hour and down town Fountains Circle was the location, in which I spotted the Z400. With every step bringing me closer to the growling 399cm³ twin, perplexed thoughts started to line up with small details making it unambiguously clear. Starting from the infamous evil lights, to the sharp shoulders in front of the tank right till the strikingly sharp tail, leaving you this squat down kind of look. From a looks perspective it certainly has the “Sugomi” effect with every line showing off an aggressive persona and alongside it’s design the paint job is very stealthy. 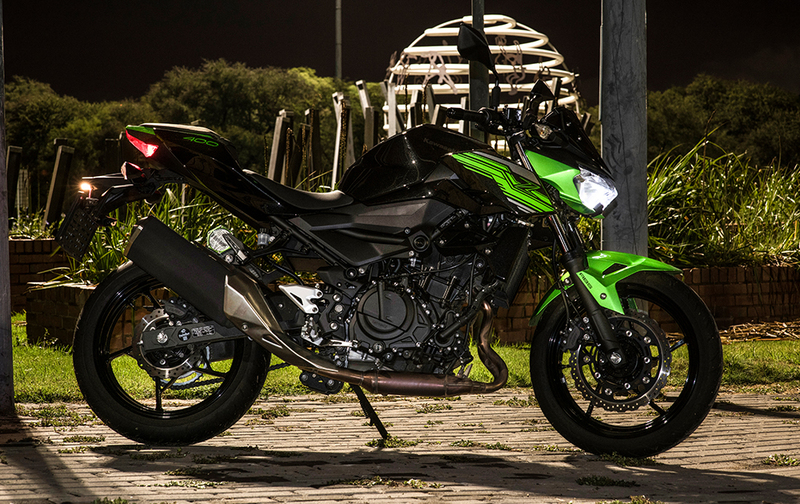 Kawasaki call this paint job “Storm”, with a metallic black tank and some candy green looking Z finishes on the side fairings, this really underlines it’s aggressive design features. After spending a few days and a few hundred kay’s together, the Green Hornet and I have become somewhat familiar with one another. Although the bike is styled very aggressively, don’t let that put you off. As far as ergonomics go the Z400 is “Spot On” and is by far the most enjoyable and comfortable light weight naked bike that I have rode within it’s segment. Grab the bars and swing your leg over and the first thing you will notice is the low seat height, which is there to accommodate a larger variety of riders as well as to give you more confidence. 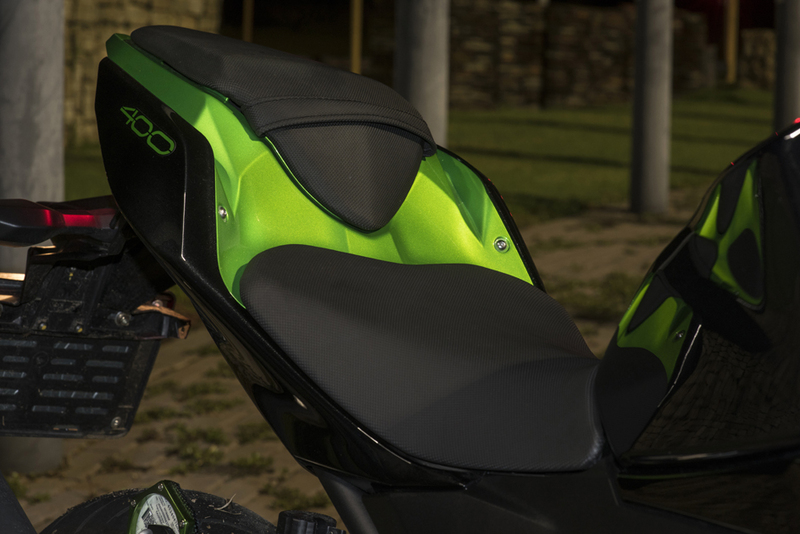 Another thing you will notice is that you are not mounted on top, but rather in the motorcycle, with the tank being higher and the bars within easy reach. 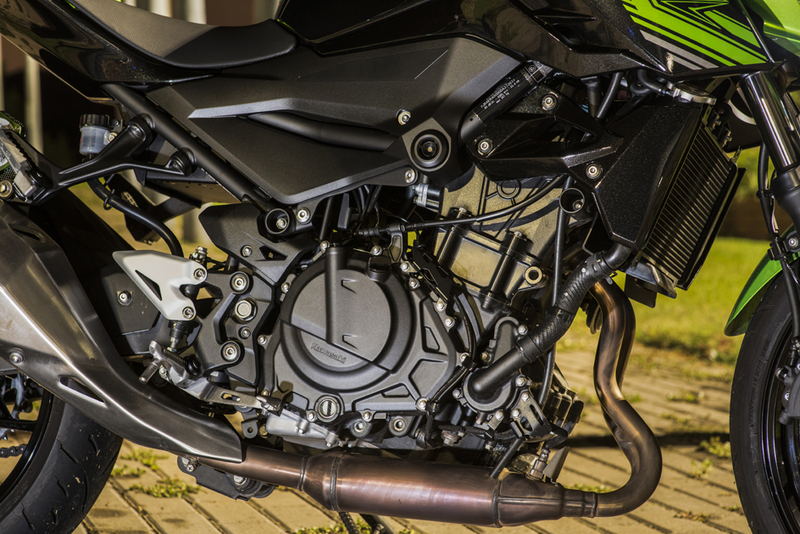 A soft seat combined with a small fly-screen is close to luxury for us naked bike riders and that is what you get on the Z400. 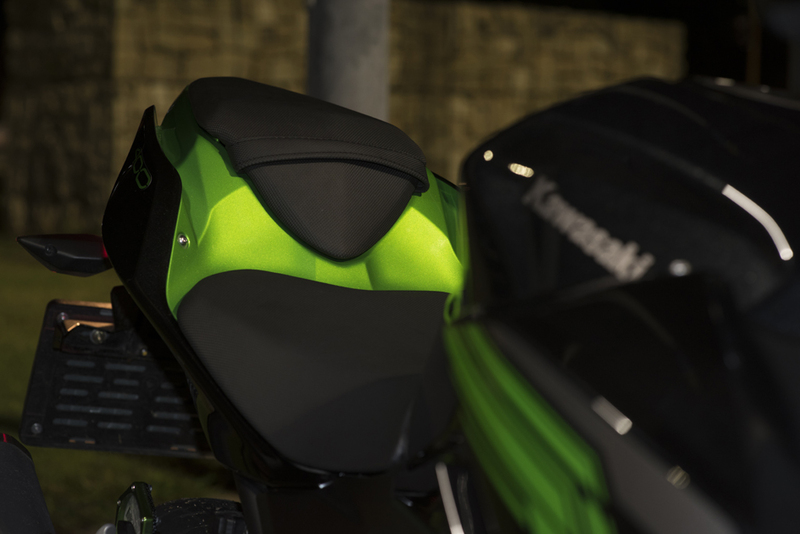 Kawasaki do have a taller screen available but honestly by sitting so low in the saddle, I don’t feel the need for one. 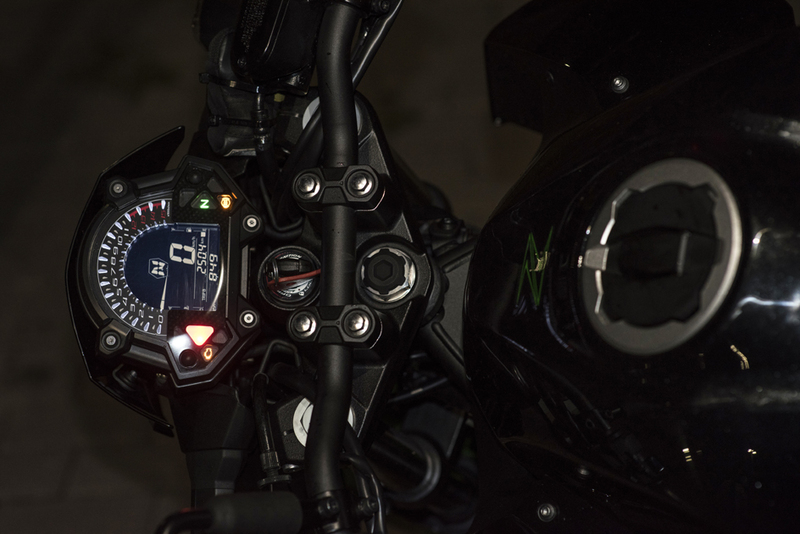 Put the key in and turn the ignition on, the green hornet has a Z650 inspired dash with all the information one needs to know. 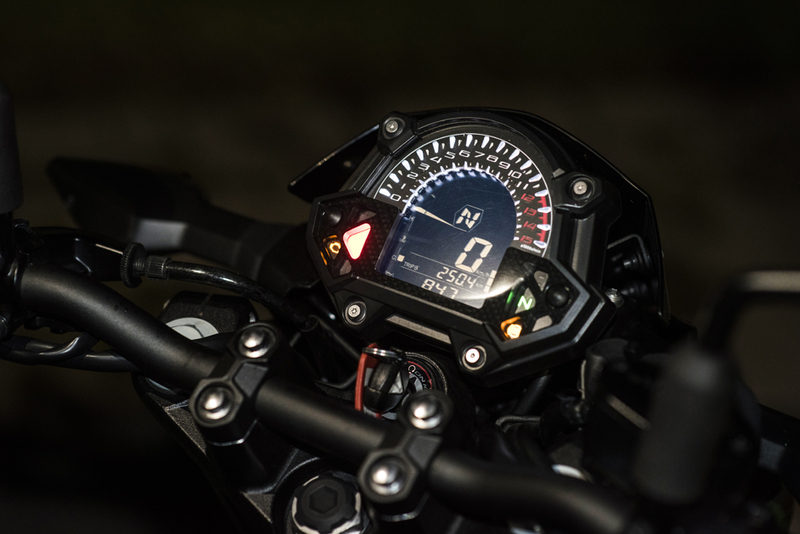 Ok, so it’s not a TFT display but to be honest the Z400 has a dash that just works and with less distractions, I was certainly a happy sailor only having to deal with two buttons. 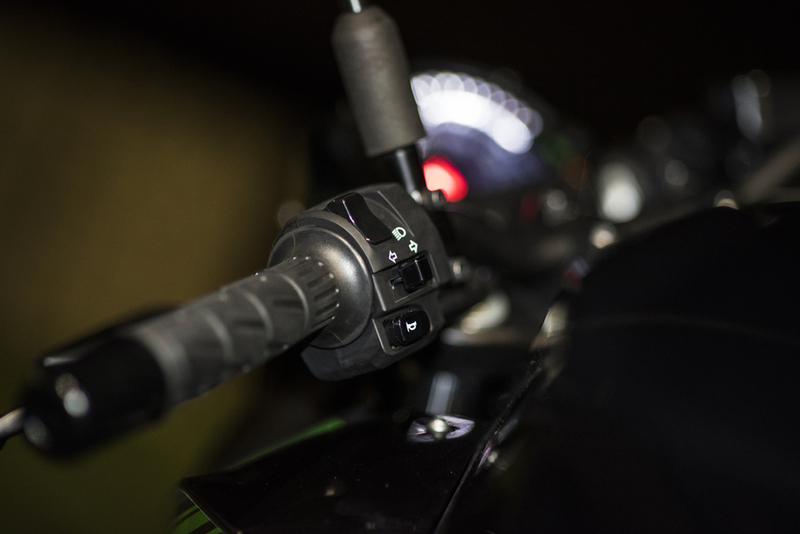 The switch gear is very basic and just like on the Ninja 400, unfortunately not backlit but again once you get familiar with the controls this becomes second nature just like pulling in a clutch. Time to slide on my Arai and zip up, for the Z400 and I have some dark streets and alleyways to tear up. With Queen’s song “Tear it up” playing in the back of my mind like a back track to a getaway scene in a movie, I felt like a total badass on the Green Hornet. 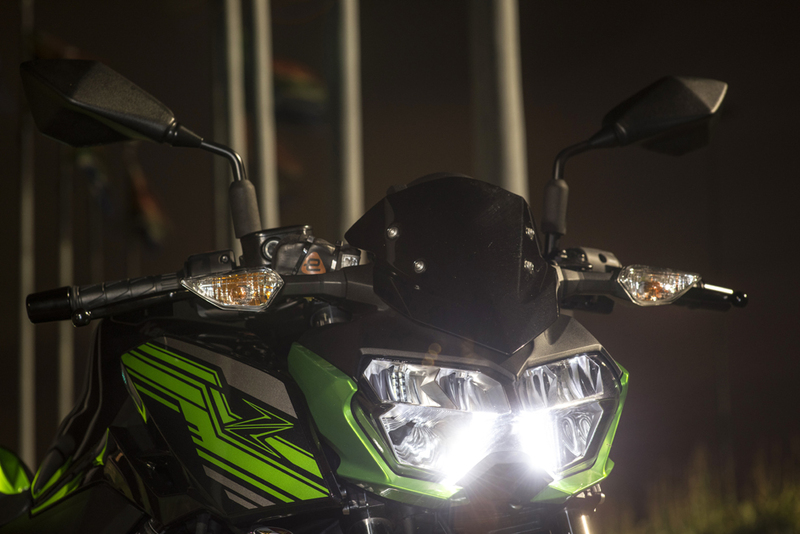 Nothing inspires a rider more at the darkest hour than a good set of lights. The Green Hornet’s evil eyes stare into the darkest of dark and bring forth the light. All this is done with ease as the dark is taunted by a smirk coming from the Z400 and a growl as I shift past 7500 RPM, just where the downdraft intake starts to purr. 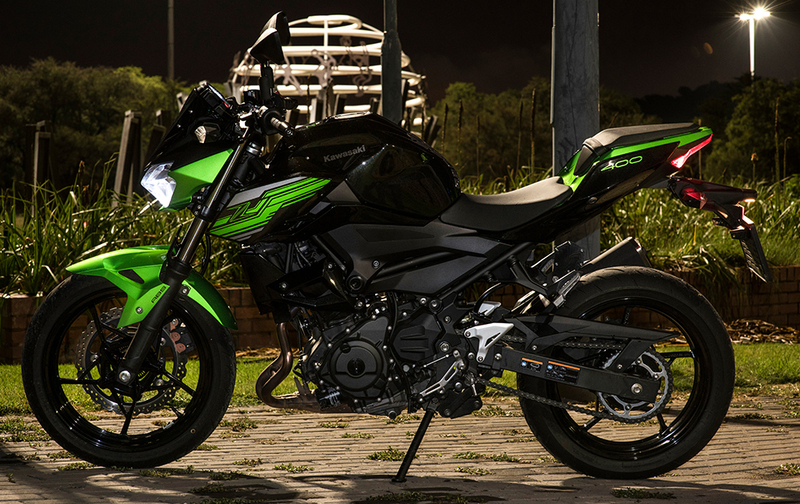 The Z400 has the same 399cm³ motor that has proven to be a versatile and fun crackerjack of a motor in the Ninja 400. 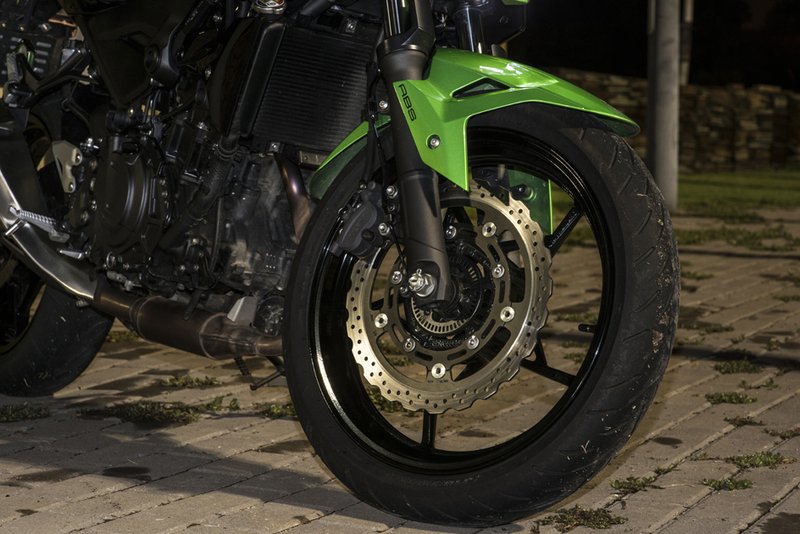 What many manufacturers do when making a naked version of a bike is change the gear ratios, making the naked option shorter geared for town use but this usually leads to a massive blackhole on the highway or on the open road. 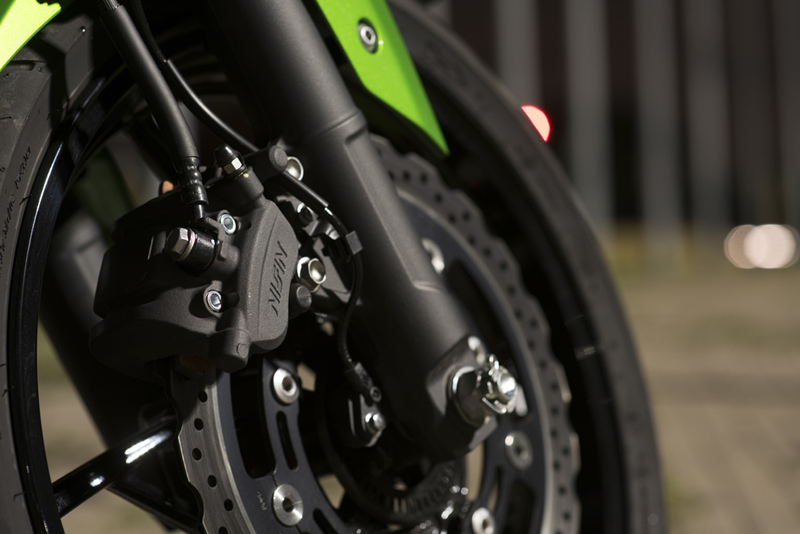 Kawasaki have not changed the gearing on the Z400 so you’ve got an easy and smooth bike to ride in town under 7000 rpm with peak power only kicking in at 10 000 rpm with an impressive 44.5hp and a good hit of 38Nm of torque. This all translates to a comfy 7000 rpm at 120km/h in 6th gear on the open road with still 5000rpm at hand before the red line is met. 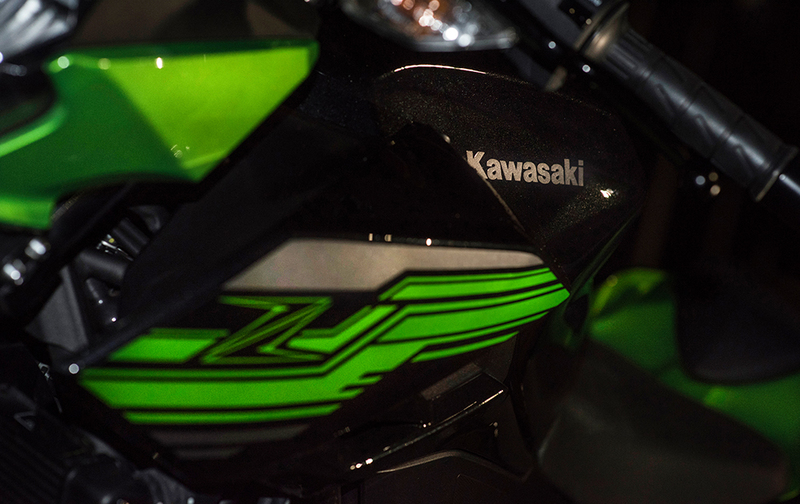 With low revs being achieved, thanks to Kawasaki’s smart gear ratio, you are blessed with not only a class leading top speed but also a great fuel economy. A 14 litre tank is what you get, and with those 14 litres of fuel I managed to get just under 318 kilometres (22.7km/L) in which there was mostly urban and highway riding involved. 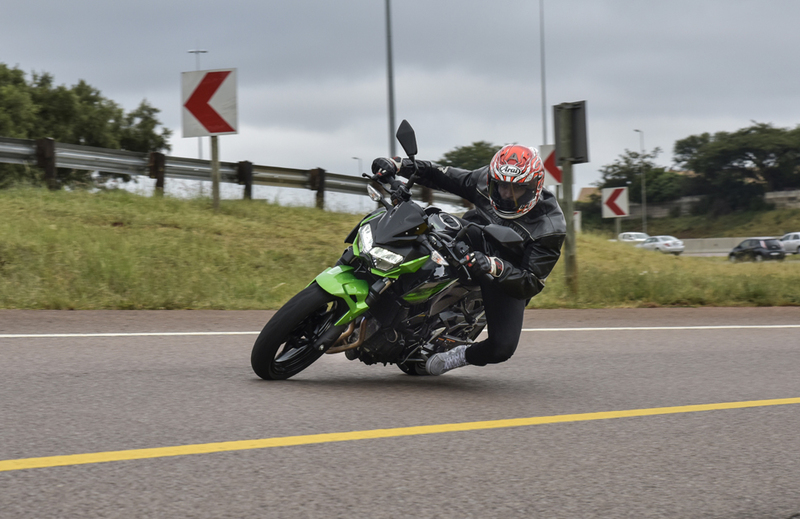 I must add that this was achieved due to ZA Bikers weight protocol (My 70kg’s), just like in MotoGP were weight is critical when it comes to the handling of a motorcycle and in my case fuel economy on the smaller bikes. As the Sun starts to rise the Green Hornet and I are greeted with sunny skies and dry-ish roads. 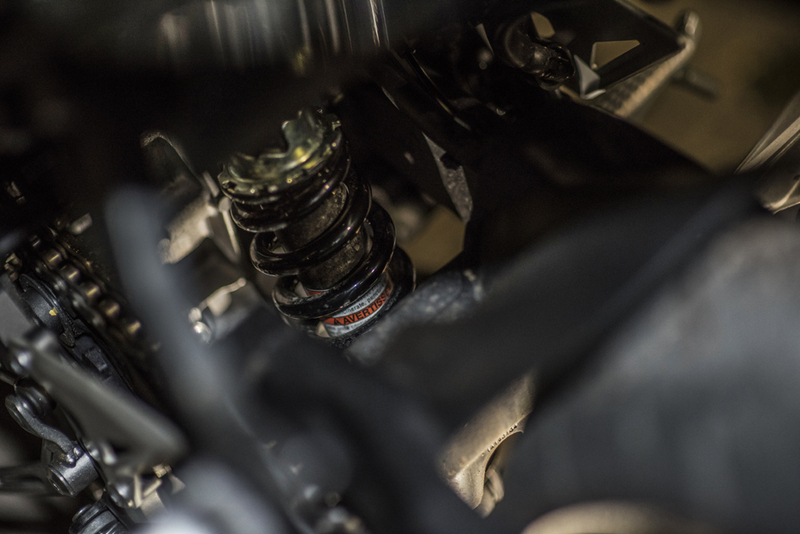 Whilst approaching corners, gear after gear is found smoothly and without any hassle. 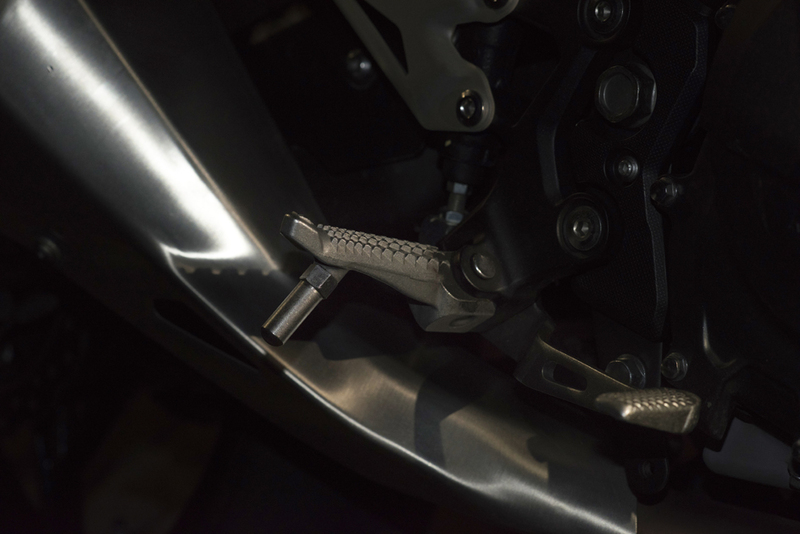 Two knocks down with my left foot and the slipper clutch is released, with the help of both ABS equipped Nissin callipers, the front Showa forks are compressed and ready to lean in with the Dunlop Sportmax tyres warmed up. 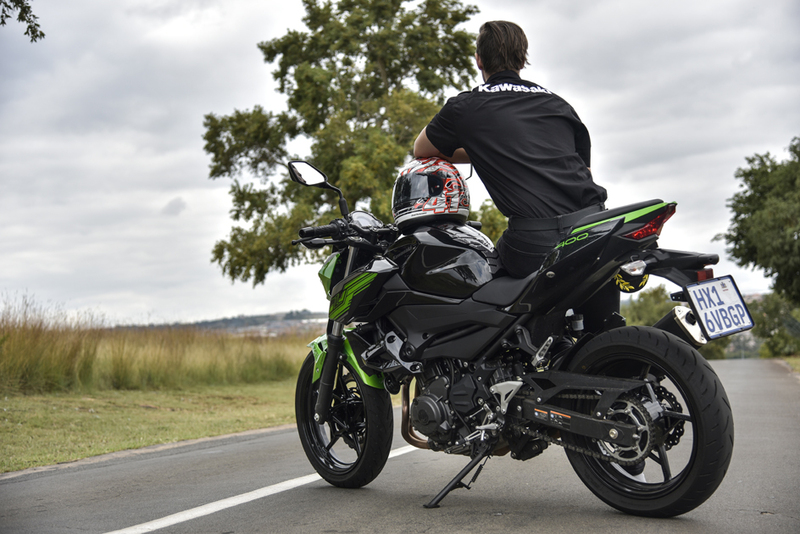 From entry to mid and beyond, the Z400 holds it’s line giving you supersports bike confidence and naked bike comfort all at once. 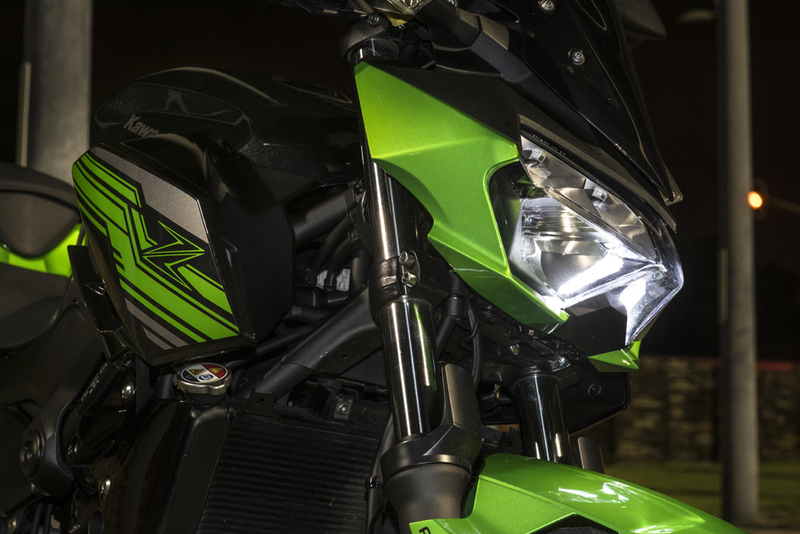 Kawasaki say they have softened the suspension by 10% and man my thumbs are up because it hasn’t taken anything away from sporty riding; and for the streets it has actually improved it all round. 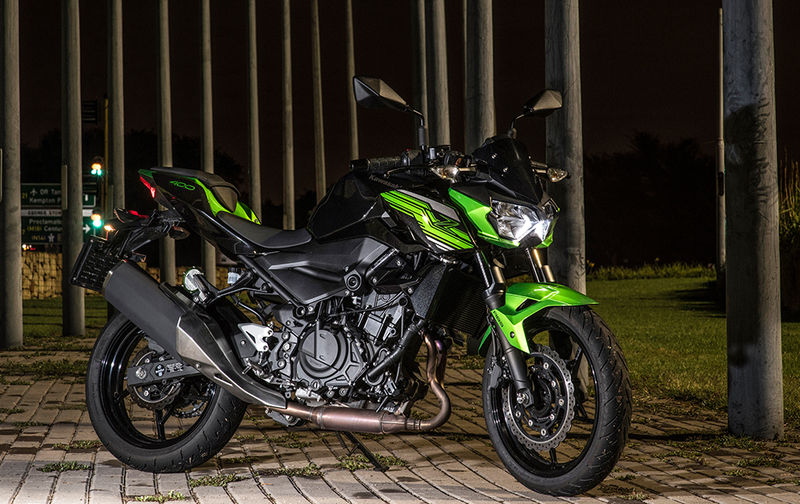 So I was asked the question by Simon and Dave, whether I would park the Z400 or the Ninja 400 in my garage. Watching all of Kawasaki Motors “Toughest Choice Ninja Or Z” videos the past year, I never thought it would be so difficult to answer the very question myself. After what felt like years of thinking and meditating on all the strong points of each bike, I nearly went into a mental state and just decided to flip a coin because honestly they are both awesome bikes. Unfortunately the coin landed in a pond so my answer is inconclusive but do yourselves a favour and visit a Kawasaki dealer and take both bikes for a doddle. You won’t be left unsatisfied – that I can guarantee. The post Gonzalez Wins Again As Deroue Podiums At Home appeared first on . The usual mind-bendingly close and exciting WorldSSP300 championship race at Assen saw a leading bunch of 19 riders cross the line almost as one, with Spain’s Manuel Gonzalez (Kawasaki ParkinGo Team) taking his second win in succession, doubling up on his recent success at home in Motorland Aragon. After the results of the race were revised from those first flashed up on the TV screens, Gonzales was finally confirmed as the winner, from another Ninja 400 rider – local man Scott Deroue (Kawasaki Motoport). Deroue had finished the Motorland race third, moving up by one place at his local track after an astounding contest in the highly oversubscribed WorldSSP400 grid. Scott was eighth at the end of the penultimate lap, making his push at just the right time to be in contention for the win. Reigning World Champion Ana Carrasco (Kawasaki Provec) led the race with just a few corners to go but was swamped by other riders desperate to get on the podium. She finished eighth, but still only 0.780 seconds from the winner Gonzalez. 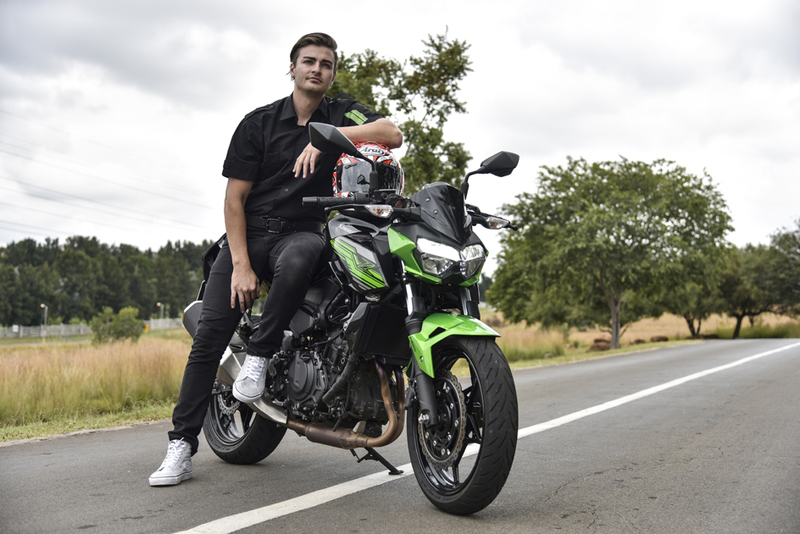 It was a good day for Kawasaki riders in general again, with young Ukrainian rider Nick Kalinin (Nutec – RT Motorsports by SKM) the third Ninja rider in the top four. Bruno Ieraci (Kawasaki GP Project) was seventh, one place and 0.192 seconds ahead of Carrasco. Local rider Robert Schotman (Motoport Kawasaki) was 12th today, but as an indication of how close and competitive this class is in 2019, Robert was only 1.180 seconds back from the winner. The top 19 riders were covered by just 2.305 seconds at the chequered flag. Once again 50 riders tried to make sure they could qualify for the race today, but after snow, sleet and a wet tack surface cancelled the ‘Last Chance’ race on Saturday afternoon, all of the 34 riders who started the race today came direct from the ‘A’ and ‘B’ groups in qualifying and Superpole. In the championship standings, after round two, Gonzalez leads with a perfect 50 points, Deroue is second with 36, and Hugo De Cancellis is third with 31. Schotman is 10th and Carrasco 11th. The third of nine rounds this season will be at Imola, In Italy, with raceday on Sunday the 12th of May. The post Two Race Sunday Gives Rea Two Podiums appeared first on . After the postponement of the first planned race from Saturday to Sunday, both of Assen’s 21-lap races took place today, with Kawasaki Racing Team rider Jonathan Rea scoring first a second and then a third place finish. His team-mate Leon Haslam rode to fifth in race one and then a more difficult eighth in race two. Under sunny skies, but in bitterly cold conditions, the first race took place at 11am, with Rea starting from eighth on the grid and Haslam fifth. Rea would work his way into third place after two laps, then second place from lap eight to the end. Haslam fought hard with Alex Lowes to finish fifth in the opening race. In the second race Rea hit the front very early and led for the first five laps, as a battling bunch of seven riders began to form. With Haslam fourth in the first few laps he looked set for another good result, but a fading front tyre saw him drop back to finish eighth. Today Kawasaki overtook Honda as the second most successful manufacturer in WorldSBK history in terms of podium finishes, with a new total of 393. After Assen Rea is still a clear second in the championship points table, having finished second ten times in 11 races, and third in the remaining one today. He sits 53 points from Alvaro Bautista’s lead with his total of 183, while Leon’s Assen results keep him fifth overall, with 93 points. The next round of the championship will take place at the parkland circuit of Imola, in Italy, between the 10th and the 12th of May. In a competitive day for the Independent Riders Toprak Razgatlioglu (Turkish Puccetti Racing) and Jordi Torres (Team Pedercini Racing Kawasaki) each scored the same total of championship points in Assen – 14 – but the best single performance came from Jordi, who was eighth in race one, with Toprak only 0.049 seconds behind in ninth, despite the painful effects of a heavy fall on Saturday. In race two Razgatlioglu edged out Torres for ninth place by just over half a second. With Leandro Mercado (Orelac Racing VerdNatura Kawasaki) injured at Motorland Aragon last weekend the team’s replacement rider for Assen, Hector Barbera, was 16th after having to pit in race one. He placed 16th again in race two, ahead of one other rider. The post Brilliant RINS Wins His First MOTOGP Race In Texas appeared first on Suzuki Motorcycles. The post Gonzalez Wins As Carrasco Finds No Luck At Home appeared first on . The opening round of the new-look WorldSSP300 championship took place this weekend at the Spanish circuit of Motorland Aragon, with a win for Kawasaki and two podium places for the Ninja 400 in total. Spanish rider Manuel Gonzalez, only 16 years of age, took his Kawasaki ParkinGo Team to the very top step of the podium at his home race. Last year he scored three podiums in this exciting class, designed around young riders, but to record his first WorldSSP300 race win at home left the teenager from Madrid almost speechless. He had also taken pole position after Superpole Qualifying, with a new best lap of 2’06.938. Title challenger in previous seasons, Scott Deroue (Kawasaki Motoport) had a remarkable ride from 14th on the grid to third place, picking off rivals at just the right time to get him into the leading bunch in the final lap. Ana Carrasco (Kawasaki Provec), the reigning champion, was well in the multi-rider fight for the podium places but was unlucky to fall on lap six after being hit from behind, losing the chance to start her title defence in style. Like all her competitors she will have eight more chances to go all-out for race wins, in a season that runs from Motorland in April to Losail in October. Ana, the first woman to win a full FIM World Championship in roadracing, does not leave her home round without any reward. She set a new lap record on lap two, with a 2’07.487 on her impressive run through to the leading positions. With over fifty young hopefuls trying to take ultimate glory in the FIM Supersport300 World Championship in 2019, qualifying has to be split into ‘A’ and ‘B’ groups, with the fastest few from each group being joined on the final starting grid for the race on Sunday afternoon by the top riders from a ‘last chance’ race on Saturday. A few talented riders needed to qualify for the grid via that last chance race route, and even some others like Deroue and Carrasco found it relatively tough in qualifying. No less than 36 riders started the 11-lap race today. Bruno Ieraci (Kawasaki GP Project) was another top ten rider at Motorland on a Ninja 400, in eighth place. Robert Schotman (Motoport Kawasaki) just missed out on the top ten places in 11th. No fewer than 11 of the top 20 riders were on Kawasakis today. Proof of just how competitive this class is can be found in the fact that the top seven riders were covered by just 0.891 seconds at the chequered flag in Motorland. In the current championship standings, with just one race gone, Gonzales leads with 25 points, Hugo De Cancellis has 20 and Deroue 16. The next round will take place in a few days time, at Assen in the Netherlands, with raceday on Sunday the 14th of April.